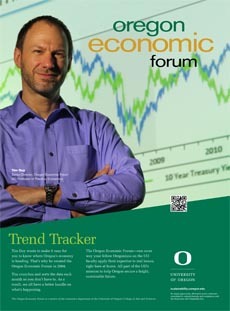 The University of Oregon State of Oregon Economic Indicators for March 2015 is now available here. The release date is May 7, 2015. Special thanks to our sponsor, KeyBank. The Oregon Measure of Economic Activity edged up in March and remains consistent with conditions of above average growth. The three-month moving average, which smooths month-to-month volatility in the measure, was 0.61, where “zero” for this measure indicates average growth over the 1990-present period. The manufacturing, household, and services sectors contributed positively to the measure, while the construction sector was negative. The manufacturing sector, however, contributed only slightly positively as employment and national indicators were weak; hours worked in the sector remains solid. The household sector was bolstered by low levels of initial claims and a low unemployment rate. Like last month, the low unemployment rate was driven in part by a decline in the labor force. In the calculation of this measure, the two effectively cancelled each other out. A low unemployment rate in the context of a rising labor force would be more consistent with past expansions in Oregon. The University of Oregon Index of Economic Indicators slipped a slight 0.1 percent in March, breaking a trend of six consecutive months of gains. Initial unemployment claims continue to track at historically low levels and employment services payrolls (mostly temporary help positions) rose; both suggest solid job growth is likely to continue. Residential building permits (smoothed) edged downward from recent trends; activity remains muted compared to that seen in past recoveries. The Oregon weight distance tax (a measure of trucking activity) rose again, sustaining a general upward trend in the measure. Core manufacturing orders (a national indicator) remain sluggish, likely reflecting the impact of a stronger dollar, decline in oil well drilling, and a West coast port slowdown early in the year. Consumer sentiment (smoothed) rose again. 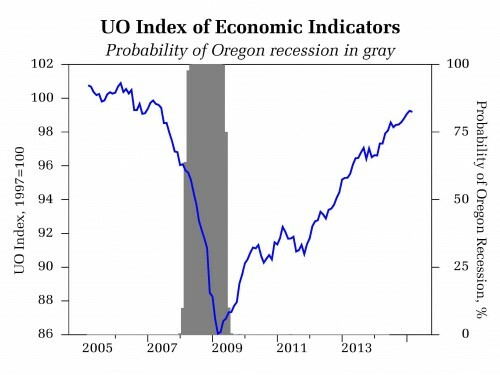 The two indicators suggest ongoing growth in Oregon at an above average pace of activity. The ongoing US economic expansion provides sufficient support to expect that Oregon’s economy will continue to grow for the foreseeable future.